TRAIL is a recently described member of the TNF superfamily. The ability of TRAIL to induce apoptosis in a large number of tumors has stimulated interest in TRAIL as a tumor therapeutic agent. Although TRAIL mRNA is expressed in a number of tissues, its functional significance to various organs is unknown. Because tumors rarely develop in the eye, we have examined this organ for functional TRAIL expression. Our analysis revealed that TRAIL mRNA and protein are constitutively expressed on numerous ocular structures, including the cornea and retina. More importantly, ocular tissue displays functional TRAIL as determined by in vitro killing of TRAIL-sensitive tumor cell lines. Previous studies have shown that ocular tissue also expresses functional Fas ligand (FasL). To assess the contribution of TRAIL and FasL for tumor cell killing in the eye, cell lines susceptible to both TRAIL and FasL were examined. The results show that ocular tissue kills via either ligand, suggesting a compensatory mechanism between TRAIL and FasL. Collectively, these results provide physiological evidence for ocular TRAIL expression, and suggest a role for this molecule in tumor surveillance in an immune privileged site. For many years, it has been recognized that there are sites in the body in which immune responses are forbidden. These areas prohibit immunity at the expense of clearing pathogens, because even minor inflammatory episodes can threaten organ integrity and function. Because these sites seemed to be exempt from immune responses, they were labeled immunologically privileged. The best-known example of an immune privileged site is the eye, and much of what we know about immune privilege is based on observations involving this organ. The immune privilege of the eye is best demonstrated by the remarkable success of corneal transplants in humans that do not require tissue matching or immunosuppressive therapy to obtain high rates of acceptance. For many years, it was thought immune privilege in the eye was due to the lack of lymphatic drainage and the presence of physical barriers between the blood and the eye (called the blood:ocular barrier). Moreover, it was also believed that Ags were sequestered in the eye from the immune system, thereby sparing the eye the damaging effects of inflammatory cells because they cannot reach this area. It is now known that ocular immune privilege is much more complex, and the explanation has been expanded to include the production and action of immunosuppressive cytokines, neuropeptides, and the expression of Fas ligand (FasL)3 (1). FasL is strategically placed within the eye to induce apoptosis in invading lymphoid cells and protect delicate ocular structures (e.g., the retina). FasL-mediated killing of immune cells spares the eye from the damaging effects of inflammation to protect vision, and it may be why ocular inflammatory disease is relatively rare. Interestingly, intraocular tumors (both primary tumors and those metastasizing from distant sites) are also rare (2). Indeed, FasL has been shown to be involved in tumor surveillance (3, 4), but there are many tumors resistant to FasL-induced death. Therefore, it is probable that other tumoricidal mediator(s) is expressed in the eye. FasL belongs to the TNF superfamily of molecules, which also includes TNF and TRAIL (Apo2L). TRAIL is distinct among members of this superfamily because TRAIL mRNA has been detected in numerous tissues throughout the body, and it appears to have selective apoptotic activity toward transformed cells (5, 6). In humans, TRAIL interaction with either DR4 or DR5 (TRAIL-R1 and TRAIL-R2, respectively) triggers an apoptotic signal by recruitment of the adapter molecule Fas-associated death domain protein to the receptor cytoplasmic death domain (7, 8, 9, 10, 11). A second group of receptors, DcR1 (TRAIL-R3) and DcR2 (TRAIL-R4), lack a death domain, making them unable to induce apoptosis (7, 10, 12, 13, 14, 15). These receptors may act as decoys or transduce an antiapoptotic signal. Interestingly, while all four TRAIL receptors are widely expressed, receptor expression does not correlate with resistance or sensitivity to TRAIL-mediated death (16). This may be related to the presence of antiapoptotic molecules within the cell. The selective apoptotic activity makes TRAIL a promising anticancer therapeutic, and the potential in the treatment of cancer in vivo is being pursued. The broad tissue expression and tumoricidal activity of TRAIL strongly suggest it is nontoxic for normal tissue and involved in tumor surveillance. We have examined the hypothesis that the paucity of intraocular tumors may be related to TRAIL expression in the eye. Our results show that functional TRAIL is expressed in numerous structures in the eye, suggesting a role for TRAIL in the protection of vision from the blinding effects of tumor growth. C57BL/6 (B6) and BALB/c mice were purchased from the National Cancer Institute (Frederick, MD). B6-gld mice were originally purchased from The Jackson Laboratory (Bar Harbor, ME) and subsequently bred in our facility. BALB-gld mice were produced in our lab by backcrossing B6-gld onto the BALB/c background. Mice were used for isolation of ocular tissue at 7–10 wk of age. Recombinant human TRAIL and TRAIL-R2:Fc were obtained from Immunex (Seattle, WA). The anti-mouse TRAIL mAb (N2B2) and the plasmid containing murine TRAIL receptor cDNA (pCEP4-DR5) were provided by H. Yagita (Juntendo University, Tokyo, Japan). The human prostate carcinoma cell line, PC-3, was obtained from M. Cohen (University of Iowa, Iowa City, IA). The human melanoma cell line, WM 98-1, was obtained from M. Herlyn (Wistar Institute, Philadelphia, PA). The murine renal adenocarcinoma cell line, Renca, was obtained from R. Wiltrout (National Cancer Institute). Renca was cultured in RPMI 1640 supplemented with 10% FBS, penicillin, streptomycin, sodium pyruvate, nonessential amino acids, and HEPES (hereafter referred to as complete RPMI). PC-3 and WM 98-1 were cultured in DMEM supplemented with 10% FBS, penicillin, streptomycin, sodium pyruvate, nonessential amino acids, and HEPES. Human eye globes (Mid-America Transplantation Association, St. Louis, MO) were dissected into cornea, retina, iris, and retinal pigment epithelium (RPE) under dissecting scope, and total RNA was isolated using RNeasy kit (Qiagen, Valencia, CA), according to the manufacturer’s instruction. Total RNA was also extracted from whole eye globes (minus the lens) of mice by the same method. cDNA synthesis from the RNA samples (1 μg each) was performed using an RNA PCR kit (PE Biosystems, Foster City, CA), with the supplied oligo(dT)16 primer, and 2 μl of the reverse transcription reaction was used for gene-specific PCR amplification. Reverse transcription was performed using a thermal program of 25°C for 10 min, 42°C for 30 min, and 95°C for 5 min. PCR were performed using the following primers: human β-actin (forward, 5′-GAAACTACCTTCAACTCCATC-3′; reverse, 5′-CGAGGCCAGGATGGAGCCGCC-3′); human TRAIL (forward, 5′-CAACTCCGTCAGCTCGTTAGAAAG-3′; reverse, 5′-TTAGACCAACAACTATTTCTAGCACT-3′); mouse β-actin (forward, 5′-TGGAATCCTGTGGCATCCATGAAAC-3′; reverse, 5′-TAAAACGCAGCTCAGTAACAGTCCG-3′); and mouse TRAIL (forward, 5′-TCACCAACGAGATGAAGCAGC-3′; reverse, 5′-CTCACCTTGTCCTTTGAGACC-3′), giving products of 219, 443, 349, and 513 bp, respectively. Conditions for PCR were optimized to give only the desired product. Human β-actin PCR cycle conditions were 95°C for 45 s, 55°C for 1 min, and 72°C for 45 s for 30 cycles. Human TRAIL cycle conditions were 95°C for 45 s, 55°C for 45 s, and 72°C for 45 s for 30 cycles. Mouse β-actin cycle conditions were 95°C for 1 min, 65°C for 1.5 min, and 72°C for 2 min for 18 cycles. Mouse TRAIL cycle conditions were 92°C for 30 s, 65°C for 30 s, and 72°C for 2 min for 35 cycles. Samples were resolved on a 2% agarose gel and visualized with ethidium bromide. Human eye globes obtained from the eye bank were punctured with an 18-gauge needle and fixed in 10% neutral buffered Formalin. Mouse globes were punctured with 30-gauge needle before fixation. The fixed globes were embedded in paraffin, and 4-μm sections were obtained. Following blocking with normal donkey serum (Sigma-Aldrich, St. Louis, MO), tissue sections were stained with K-18 anti-TRAIL Ab (1:20; Santa Cruz Biotechnology, Santa Cruz, CA) at 4°C overnight. Then sections were blocked with rabbit serum (Vector, Burlingame, CA), incubated with biotinylated rabbit anti-goat Ab (Vector), streptavidin-HRP (Vector), and Vector VIP substrate sequentially. Between incubations, sections were washed four times in PBS. After final washing, sections were coverslipped with Del/Mount (Biomeda, Foster City, CA). To demonstrate the specificity of the staining, tissues were stained with K-18 Ab after preadsorption with 19-fold weight excess of the blocking peptide (Santa Cruz Biotechnology). Human eye globes were dissected into cornea, retina, iris, and RPE. Corneas were placed in PBS at 37°C for 1 h, and separated into endothelial and epithelial halves. Dissected tissues were placed in PBS containing 1% Nonidet P-40 (Sigma-Aldrich) and protease inhibitor mixture (Roche, Basel, Switzerland). Tissues were ground using a Tissue Tearor (Biospec Products, Bartlesville, OK). The lysed tissues were centrifuged at 14,000 × g to remove cellular debris, and the protein concentration of each sample was determined using the colorimetric bicinchoninic acid assay (Pierce, Rockford, IL). Equal amounts of protein were separated on 10% Bis-Tris gel (Invitrogen, Carlsbad, CA), transferred to 0.2-μm nitrocellulose membrane (Invitrogen), and blocked with 5% skim milk in TBS/0.05% Tween 20 for 2 h. The membrane was incubated with anti-TRAIL Ab (Peprotech, Rocky Hill, NJ) at 4°C overnight. After washing, the membrane was incubated with HRP-conjugated anti-rabbit Ab in Tris-Tween 20 for 1 h. Following several washes, the blot was developed by chemiluminescence (ECL-plus; Amersham-Pharmacia, Piscataway, NJ). Control blots were processed without incubation of the primary Ab. Whole human corneas were quartered and placed in 48-well plates with endothelium facing up. Tumor cell lines were labeled for 2 h with 5 μCi/ml [3H]thymidine at 37°C in complete DMEM. Cells were washed three times with PBS and resuspended in complete DMEM. The target cells (105 in 5 μl) were placed on the corneal endothelium and cultured for 16–20 h at 37°C. Each culture was divided into two wells of a 96-well plate, and unfragmented DNA was collected by filtration through glass fiber filters (Packard Instruments, Meriden, CT) using a Filtermate 96 cell harvester (Packard Instruments) and counted on a microplate scintillation counter (Packard Instruments). Data are expressed as percentage of DNA fragmentation: (100 × (cpm from cells not cultured with cornea − cpm in experimental group) per cpm from cells not cultured with cornea) ± SEM. Specificity of killing was determined by inclusion of the chimeric protein TRAIL-R2:Fc or Fas:Fc (R&D Systems, Minneapolis, MN). Killing assays using mouse cornea were performed with slight modification. Mouse cornea was dissected with iris attached. Each cornea was placed in U-bottom 96-well plates with endothelium-iris facing up in complete RPMI. Labeled tumor cells (104 in 1 μl) were placed in the pocket between endothelium and iris. Specificity of killing was determined by inclusion of TRAIL-blocking Ab N2B2 or Fas:Fc. The mouse mastocytoma P815 was transfected with murine TRAIL receptor cDNA (P815-DR5) (mouse DR5 is also called MK (17)) or vector control (P815-Ctrl) using Lipofectamine Plus Reagent (Invitrogen). Tumors were then examined for TRAIL and FasL sensitivity in vitro, as described above. None of the lines were sensitive to Fas-mediated death, and only the P815-DR5 cells were TRAIL sensitive (average killing, 70–80%). Tumors were then injected into the AC of BALB/c mice (100 cells/mouse), and tumor growth was monitored daily for 14 days. Data are recorded by a masked observer using a dissecting microscope. They were scored as percentage of the AC that was filled with tumor. The wide distribution of TRAIL mRNA prompted us to examine the eye for TRAIL expression. Fig. 1⇓ shows that human TRAIL mRNA was detectable by RT-PCR throughout the human eye, including the cornea, iris, retina, and RPE. The presence of human TRAIL protein was then verified by Western blot analysis in which a ∼33-kDa band, corresponding to monomeric TRAIL, was detected (Fig. 2⇓). Mouse eye lysates also contained TRAIL mRNA species (Fig. 1⇓). Immunohistochemical analysis revealed TRAIL protein was constitutively expressed on both human (Fig. 3⇓, A–C) and mouse ocular tissues (Fig. 3⇓, E and F). In the cornea, it was expressed on the endothelium and epithelium (Fig. 3⇓, A and E), with modest staining in the stroma. TRAIL protein was also detected on the iris (data not shown), ciliary epithelium (Fig. 3⇓B), RPE, and neurosensory retina (Fig. 3⇓, C and F) of both species. RPE and iris expressed the highest levels of TRAIL protein, as determined by immunoblotting (Fig. 2⇓), while the signal in the corneal layer was less prominent compared with the immunohistochemistry data. This was most likely due to the dilution of TRAIL by the high level of matrix proteins found in the corneal stroma. Constitutive TRAIL mRNA expression in the eye. RT-PCR for TRAIL and β-actin was performed on mRNA isolated from dissected human and whole mouse eyes. RT-PCR products were verified by sequencing after cloning into TOPO TA cloning vector (not shown). 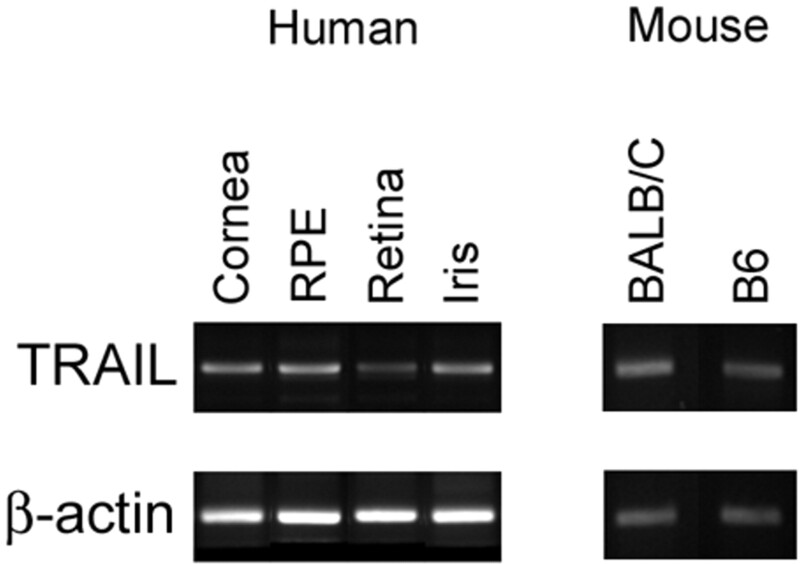 TRAIL protein expression in human eye tissues. Protein extracted from eye tissues was subjected to SDS-PAGE and transferred to nitrocellulose. The blot was probed with anti-TRAIL and followed by goat anti-rabbit HRP. The 33-kDa band corresponds to full-length monomeric TRAIL. Control blot probed with the goat anti-rabbit HRP is shown on the bottom. Localization of TRAIL in the eye. Human and mouse tissue was stained with goat anti-TRAIL Ab, followed by donkey anti-goat Ig-biotin and streptavidin-HRP. Positive staining was visualized by Vector VIP substrate. Counterstaining was not performed. A, Human cornea; Epi, epithelium; Endo, endothelium. B, Human ciliary body; Cp, ciliary epithelium. C, Human retina and choroid (Ch); INL, inner nuclear layer; IS, inner segment; ONL, outer nuclear layer; OS, outer segment; PC, posterior chamber; PE, pigmented epithelium. 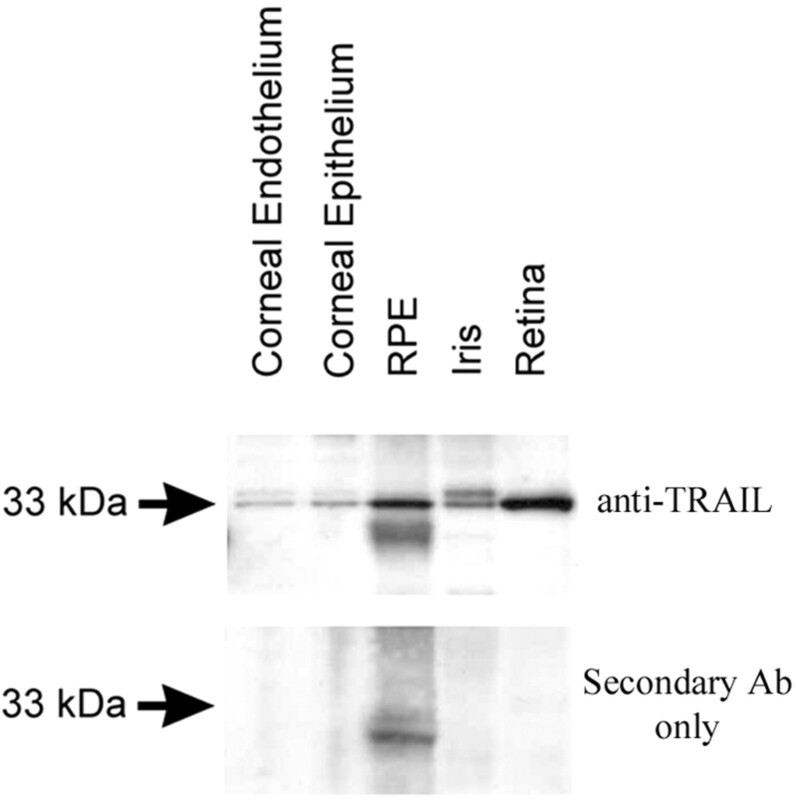 D, Negative staining control of human retina and choroid with preadsorbed anti-TRAIL Ab. E, Mouse cornea. F, Mouse retina and choroid. Although TRAIL mRNA is expressed in numerous sites in the body, studies demonstrating functional expression in organs and organ systems have been lacking. Therefore, we examined whether biologically active TRAIL was expressed in the eye of humans and mice. To do this, we took advantage of an ex vivo culture system developed in our lab (18), which was used to successfully demonstrate the presence of functional FasL in the eye. In this assay, isolated corneas from human or mouse eyes are placed epithelia down in the well of a tissue culture plate (forming a cup). Labeled target cells are then placed into this tissue in contact with the endothelium and analyzed for cell death by harvesting the cells and detecting the extent of apoptosis following 16- to 20-h incubation. Data in Fig. 4⇓A show that the TRAIL-sensitive skin melanoma WM 98-1 was induced to undergo apoptosis by human corneal tissue. The addition of TRAIL-R2:Fc, a specific inhibitor of TRAIL binding, completely inhibited cell death, confirming that the target death was indeed TRAIL mediated. Functional TRAIL on corneal endothelium. [3H]Thymidine-labeled tumor cells were incubated on isolated corneas. Apoptosis was measured as percentage of DNA fragmentation. A, TRAIL-sensitive (FasL-resistant) WM 98-1 cells on human cornea; B, TRAIL- and FasL-sensitive Renca cells on BALB/c-gld corneas. Specificity of the killing was tested by inclusion of 10 μg/ml TRAIL-R2:Fc (A) or 5 μg/ml antagonistic anti-mouse TRAIL Ab N2B2 (B). TRAIL expression on mouse corneal tissue was then examined using the mouse renal adenocarcinoma cell line, Renca, as the target cell. Unlike WM 98-1, Renca cells are sensitive to cytotoxic effects of both TRAIL and FasL (data not shown), so we used corneas from FasL-defective BALB/c-gld mice. Data in Fig. 4⇑B show that Renca cells were killed by gld corneal endothelium, and this apoptosis was inhibited by inclusion of a TRAIL-specific blocking Ab (N2B2). We conclude that functional TRAIL is present on the mouse cornea. FasL is constitutively expressed on human and mouse corneas, as shown by its ability to kill Fas-bearing tumor cells (19) and invading lymphoid cells (18). To determine the contribution of both TRAIL and FasL, we used the TRAIL- and FasL-sensitive human prostate adenocarcinoma cell line, PC-3. Fig. 5⇓A shows human corneal tissue induced apoptosis in PC-3 cells that was inhibited only when both Fas:Fc and TRAIL-R2:Fc were included in the culture. A similar study in the mouse cornea revealed the presence of both functional TRAIL and FasL (Fig. 5⇓B). In this experiment, the killing of Renca cells by normal B6 corneas was reversed by inclusion of Fas:Fc and N2B2. TRAIL and FasL cooperate to induce apoptosis. [3H]Thymidine-labeled tumor cells were incubated on isolated corneas overnight, and apoptosis was measured as percentage of DNA fragmentation. A, TRAIL- and FasL-sensitive PC-3 cells on human cornea; B, TRAIL- and FasL-sensitive Renca cells on B6 cornea. 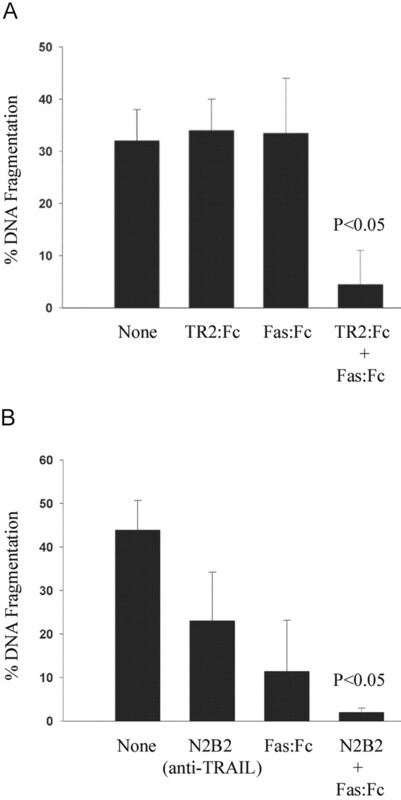 The contribution of FasL and TRAIL to the tumor cell killing was assessed by inclusion of 1 μg/ml Fas:Fc, and 10 μg/ml TRAIL-R2:Fc (A) or 5 μg/ml N2B2 (B). We then examined the ability of the ocular microenvironment to inhibit tumor growth in vivo. To do this, we took advantage of the tumor line P815 that grows readily in the AC of the eye, but grows poorly in the skin (20). P815 was tranfected with mouse DR5 (P815-DR5) or the empty plasmid vector (P815-Ctrl). In vitro cytotoxicity determined that P815, P815-Ctrl, and P815-DR5 were not sensitive to Fas-mediated death, and that only P815-DR5 was sensitive to TRAIL-induced apoptosis (not shown). We then injected 100 tumor cells into the right eye of BALB/c mice and monitored tumor growth daily for 14 days. Initially, all tumors grew and were visible by day 3 (not shown). However, the majority of the P815 and P815-Ctrl tumors continued to grow, while the P815-DR5 tumors regressed substantially, or did not grow at all. Data in Table I⇓ reflect our observations on day 14 and are the sum of two separate experiments. Nearly all (79%) wild-type P815 tumors were solid tumor by day 14, filling the entire AC. The vast majority of P815-Ctrl tumors were either solid tumors (8 of 15) or filled greater than 50% of the AC (4 of 15). In sharp contrast, no P815-DR5 cells developed into solid tumors. Most of these eyes were either devoid of tumors (9 of 24), or tumors filled less than 50% of the AC (12 of 24). Due to the aggressiveness of the wild-type and P815-Ctrl tumors, these mice were sacrificed on day 14. In a subsequent study, we monitored the P815-DR5 tumors until day 21 (n = 20). Seventy percent of the mice had no tumors, while 20% had very small tumors remaining in the eye. Ten percent of these mice eventually developed solid tumors, but these were significantly delayed and never to the degree of the controls. These data suggest that constitutive TRAIL in the eye can inhibit the growth of TRAIL-sensitive tumor cells. We have examined the expression and function of TRAIL in the eye. Given the ubiquitous expression of TRAIL in some studies, it was not surprising that we detected TRAIL mRNA expression in the eye. However, our studies document for the first time the expression of functional TRAIL protein in an immune privileged site. Organs such as the eye may require autonomous tumor surveillance to compensate for the absence of resident immune cells. This would protect delicate ocular structures from the damaging effects of tumor growth. Because the eye expresses both TRAIL and FasL, it possesses two ligands that can induce apoptosis in a variety of normal and neoplastic cells. The well-recognized specificity of TRAIL for tumor cells suggests that it may specifically protect the visual axis from tumor growth and metastasis. The fact that tumors rarely occur in the eye compared with other organs is consistent with this idea. This hypothesis, however, will require further direct testing. The pattern of expression for TRAIL in the eye is remarkably similar to that of FasL, in which these ligands are positioned at sites of interaction between the internal structures of the eye and the outside world. 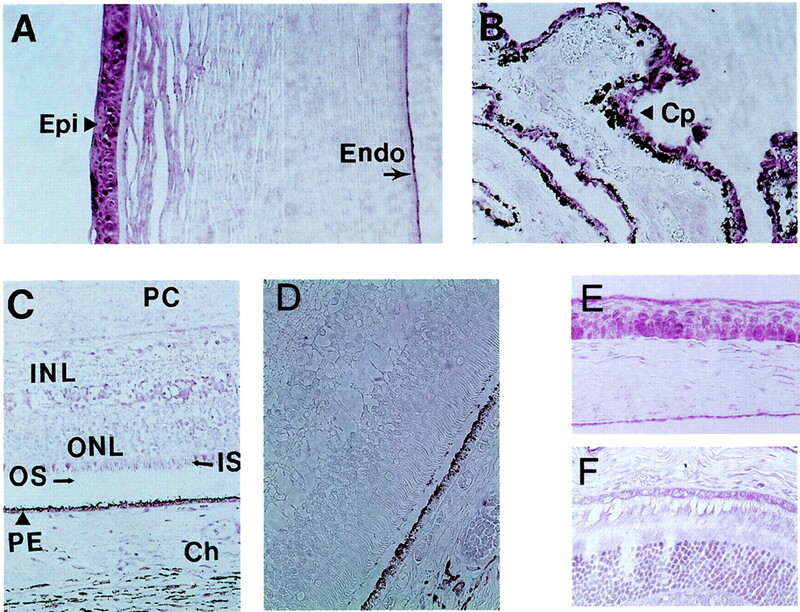 Expression on the corneal epithelium can prevent cells from entering from the conjunctiva, while expression in vascularized iris can prevent entry of cells via iris blood vessels. Expression on the corneal endothelium protects this very important single layer of cells. These nonregenerating cells are essential to the maintenance of corneal integrity and clarity. Finally, expression on the RPE forms a barrier between the photoreceptors and the vascularized choroid. It is interesting to note that most ocular tumors take up residence in the choroid, just outside the barrier formed by TRAIL and FasL. With this in mind, it will be interesting to examine TRAIL and FasL sensitivity of freshly isolated ocular tumors. Our data show that in human and wild-type mouse corneas, tumor cells can be killed by both FasL and TRAIL. In fact, simultaneous functional inhibition of both FasL and TRAIL is required to completely block apoptosis induced by the corneal endothelium. Corneal tissues from FasL-defective gld mice achieve the same level of killing (35–40%) as that obtained from wild-type mice; however, this cell death is mediated solely by TRAIL. Perhaps the expression of TRAIL compensates for the loss of functional FasL, which is an issue that is currently under investigation. An important test of our hypothesis was the demonstration of the effects of TRAIL on ocular tumor formation in vivo. Therefore, we examined the growth of the mastocytoma P815, which grows very well when injected in the AC (20). Transfection of this line with mouse DR5 severely inhibited the growth of this tumor in the eye. This suggests that ocular TRAIL can control the growth of DR5+ cells in the eye. It is not known whether TRAIL contributes to immune privilege nature in the eye, because immune privilege is defined as the prohibition of immune responses. A recent study reported the presence of TRAIL mRNA transcripts and protein in the placenta (21), implying that it may participate in immune privilege in this tissue. TRAIL is not implicated in the activation-induced cell death of normal T lymphocytes (as is FasL) (22), but TRAIL receptors are expressed on activated thymocytes, making these cells sensitive to apoptosis via TRAIL (23). TRAIL is also believed to control autoimmune inflammation, in which it has been implicated in the prevention of cycle progression in arthritogenic lymphocytes (24). In a mouse model of experimental autoimmune encephalomyelitis, TRAIL inhibits encephalomyelitis by preventing activation of autoimmune T cells (25). It is not known whether functional TRAIL is expressed in the tissues affected by these disorders. TRAIL is not expressed on freshly isolated T cells, and TRAIL expression on activated T cells is controversial (22, 26). However, NK cells have been shown to express TRAIL and use this molecule for tumor surveillance (26, 27). The involvement of the Fas/FasL pathway in tumor surveillance has been proposed, as demonstrated by the higher incidence of metastasis by Fas+ tumors in FasL-defective gld mice (4, 28). The loss of functional Fas by mutation is associated with the progression of adult T cell leukemia (29, 30) and multiple myeloma (31). The increased incidence of certain tumors in lpr and gld mice also supports this idea (32). However, even with the increased risk of lymphoma in autoimmune lymphoproliferative syndrome patients (33), the Fas/FasL system is not sufficient to prevent many malignancies. Indeed, the genetic instability of tumors and potential loss of susceptibility make it unlikely that a single molecule is accountable for the surveillance function. This suggests that there are compensatory mechanisms present, and we propose that the eye uses TRAIL in this capacity. It is predicted that ∼2100 cases of eye and orbit tumors will be diagnosed this year in the U.S. (34), with uveal melanoma comprising over 70% of these cases. The second most common ocular tumor is non-Hodgkin’s B cell lymphoma. These tumors frequently reside in the choroid (melanoma) (35) or between the RPE and Bruch’s membrane (B cell lymphoma) (36), with infrequent invasion to the retina and vitreous. The positioning of TRAIL in the eye suggests that it might contribute to these observations by preventing entry of tumors into the eye. Tumors that enter the eye may acquire TRAIL resistance through the induction of antiapoptotic proteins or mutations in TRAIL receptors. This will require further study. The protection of the visual axis by inhibitors of inflammation is well documented. It is clear that the constitutive expression of inhibitory cytokines, inhibitory neuropeptides, blood:ocular barrier, and FasL provides a basis for immune privilege. The addition of TRAIL as an inhibitor of tumor growth and/or invasion provides another dimension to protecting the eye from damage. However, it is clear the important organs such as the eye use multiple strategies to ensure integrity of function and the survival of the species. ↵1 This work was supported by National Eye Institute Grants EY06765 and EY08972, and a Department of Ophthalmology and Visual Sciences grant from Research to Prevent Blindness (New York, NY). ↵3 Abbreviations used in this paper: FasL, Fas ligand; AC, anterior chamber; RPE, retina pigment epithelium. American Cancer Society. 2001. Cancer Facts and Figures 2001 5 American Cancer Society, Atlanta, GA.